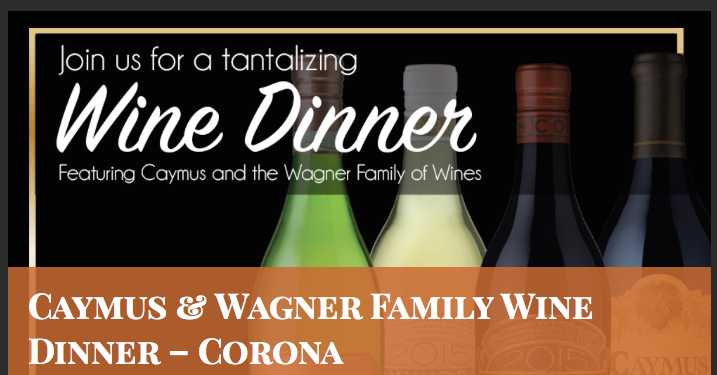 April 25, 2018 – Brian Stodart Will Perform At Citrus City Grill’s Caymus & Wagner Family Wine Dinner! Take a break from your everyday and join us for an evening for outrageous food paired with decadent wines from the Caymus & Wagner Family Wines plus LIVE ENTERTAINMENT by Brian Stodart. Each course will be paired with on of the Caymus & Wagner Family Wines, which will ignite your taste buds. Our menu for the evening will be posted shortly. Be sure to make your RESERVATION TODAY! The cost of this dinner is $125 per person.